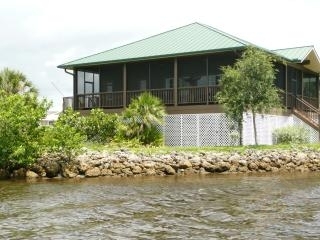 This beautiful Everglades City, FL vacation rental house by owner is located on the North side of Pleasure Island at Club Everglades. This Everglades City holiday house accommodation in Florida has the only full wraparound, screened in porch on the whole Island. Two large and luxurious bedrooms open onto this glorious space. The bedrooms offer the flexibility of king or twin bedding choices with custom baths en suite. Central air and ceiling fans are throughout this adventure rental house in Everglades City, Florida. Private and luxurious, with all the creature comforts, including flat screen TV, air conditioning, outdoor bar and more, this home is a perfect retreat for couples and families alike. There is a fully furnished kitchen which includes, microwave, dishwasher, refrigerator, and coffee maker. 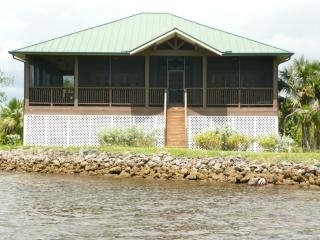 The house is just steps away from fishing, boating, hiking, and wildlife viewing. Cruise to the Keys or explore the Everglades. 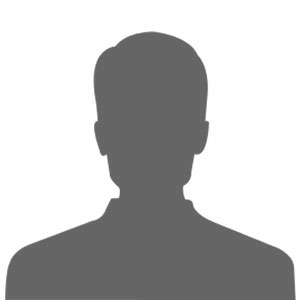 There are many more as the location is excellent for everything else visiting the famous city landmarks, eating out, and swimming, going to concerts, taking boats to the islands and other resorts on the coast, and enjoying your stay. The luxurious house vacation rental rates $600 per week. Rates are subject to change without notice. This house will bring heaven a little bit closer!